BOSTON — Red Sox star David Ortiz left Wednesday night's game against the New York Yankees in pain after fouling a pitch off his right shin. Boston said X-rays were negative. The 40-year-old designated hitter, who has announced he will retire after this season, fouled a 98.5 mph fastball from Dellin Betances off the shin in the ninth inning of Boston's 9-4 loss and was replaced by pinch-hitter Bryce Brentz, who struck out. Ortiz grimaced and started hopping on the foot, then dropped to one knee. When he arose, Ortiz bent over in pain for an extended period. Ortiz draped his right arm over manager John Farrell and his left over physical therapist Adam Thomas as he walked very slowly off the field and down the dugout steps. The usually jovial Ortiz could be heard talking loudly in a back room. "That's twice in the last few days that he's been hit in the same spot," Boston manager John Farrell said. 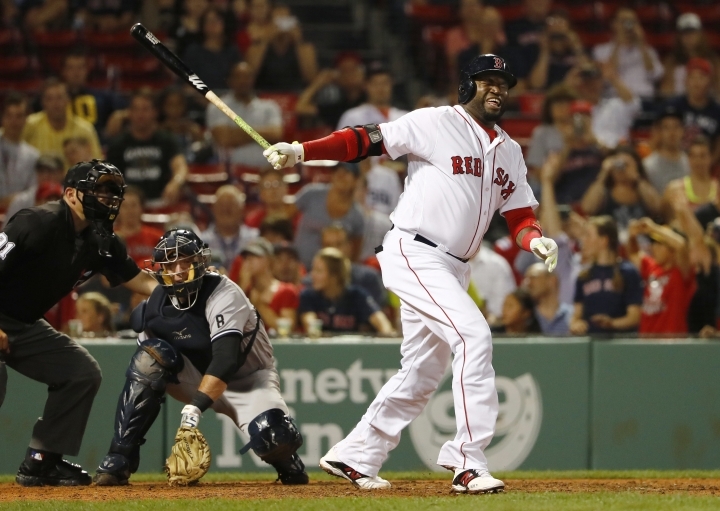 In his 20th major league season, Ortiz is hitting .307 with 25 homers and 88 RBIs. Mookie Betts had two doubles for the Red Sox, then left with right calf tightness. Boston's bullpen was tagged for eight runs in 3 2/3 innings. Benched from the starting lineup once again as his finale on Friday approaches, New York's Alex Rodriguez pinch hit and flied out in the seventh inning. Tyler Clippard (1-0) pitched one inning for his first victory with the Yankees since being acquired from Arizona last week. New York used seven relievers after starter Nathan Eovaldi left with right elbow discomfort after one inning. Umpires asked for a replay review of the count in the seventh inning with Boston's Andrew Benintendi at the plate. The count was changed from 3-2 to 2-2. A year ago, Farrell found out he had Stage 1 lymphoma. The manager said he was waiting on his one-year test results. He was informed last fall the cancer was in remission. "It means a hell of a lot has happened since last August 10," he said. "I think there's a better balance of life after what I went through." Yankees: Eovaldi, whose fastball velocity dropped to 93-94 mph from 97 mph, is being sent back to New York for further examination. RHP Michael Pineda (6-10) starts Thursday for the Yankees and left-hander Eduardo Rodriguez (2-5) for the Red Sox. Boston scratched knuckleballer Steven Wright because the All-Star jammed his right shoulder while diving into a base as pinch runner against the Los Angeles Dodgers last weekend.